The Beatles 50 Years Ago Today: December 16, 1966. Beatles Radio: The Beatles, Solos, Covers, Birthdays, News The Fab 4 and More! 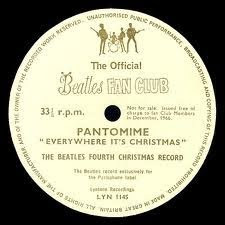 The Beatles' Fourth Christmas Record – Pantomime: Everywhere It's Christmas was sent to members of The Beatles' UK fan club on this day. The audio had been recorded on November 25, 1966, and mixed and edited on December 2, 1966. Side one: Song: Everywhere It's Christmas; Orowanya; Corsican Choir And Small Choir; A Rare Cheese; Two Elderly Scotsmen; The Feast; The Loyal Toast. Side two: Podgy The Bear And Jasper; Count Balder And Butler; Felpin Mansions (Part Two); The Count And The Pianist; Song: Please Don't Bring Your Banjo Back; Everywhere It's Christmas; Mal Evans; Reprise: Everywhere It's Christmas. I drew the cover myself. There's a sort of funny pantomime horse in the design if you look closely. Well I can see one there if you can't. "Paul McCartney"